West Virginia continued its reign as the No. 1 state for deer hits for a twelfth year, State Farm announced Monday in its annual report ahead of body shops’ and insurers’ deer season. The average claim cost for striking a deer, caribou, elk or moose rose to $4,341 between July 1, 2017, and June 30, 2018, up about 3.9 percent from the $4,179 recorded during the same period in 2016-17 by the nation’s No. 1 auto insurer. State Farm extrapolated from its own claims data to provide estimates for the entire insurance industry. Severity seems to have bounced around between $3,900 and $4,200 over the past few years, so the $4,341 seemed kind of interesting. However, State Farm public relations specialist Vicki Harper rightfully pointed out that a single data point doesn’t equate to a trend. (You need at least three.) For now, the company wasn’t treating the value as anything more than normal fluctuation, she said. But it’ll be interesting to see if more advanced vehicles and the collision industry’s 2016 awakening to scanning do boost severity in future deer reports. Harper said she didn’t know the average age of the vehicles in State Farm’s report. CCC’s database found the average repairable vehicle in 2017 to be 5.9 years old, and the average total loss to be 9.64 years old. An average repairable age of 5.9 years puts the average repairable vehicle right in the population guaranteed to carry the electronic stability control the feds made mandatory as of the 2012 model year. As Hunter Engineering pointed out, this safety technology often requires calibration following a wheel alignment, which means additional cost and complexity. Montana and Pennsylvania remained the No. 2 and 3 states for deer hits. Wisconsin, Iowa, South Dakota, Minnesota, Michigan, Wyoming and Mississippi rounded out the Top 10 most likely states for a deer claim. Mississippi knocked off North Dakota, which was No. 10 in the 2017 study. One in every 46 drivers in West Virginia will hit a deer, caribou, elk or moose, down from 1 in 43 in 2016-17. Montana and Pennsylvania tied last year’s stats at 1 in 57 and 1 in 63, respectively. 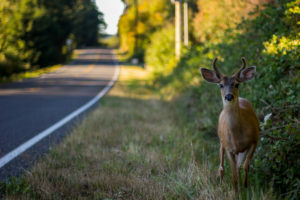 Nationally, Americans had a lower chance of hitting one of the large mammals than in the prior year — 1 in 167 compared to 1 in 162 — as the number of deer claims fell by about 10,000 despite 4 million more drivers receiving licenses, according to State Farm. 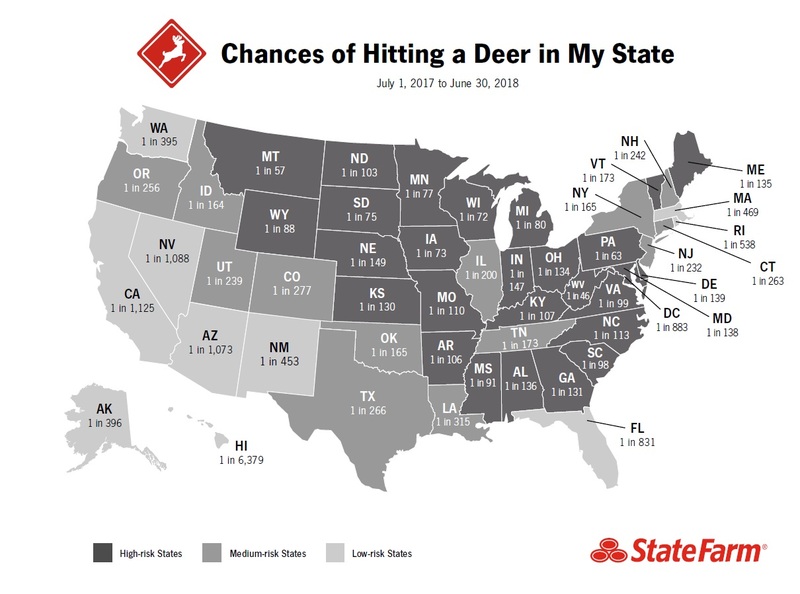 The odds of smacking into a deer double in the fall, according to State Farm. For shops looking to match staffing to potential demand, know that State Farm estimated November saw the most deer claims, followed by October and then December. “There is also an increased risk of collision with deer around dawn and dusk,” State Farm warned drivers. “Drivers should be engaged, alert and on the lookout at all times. You never know when you may need to react to a deer or other obstacle that may cross your travel path. • Slow down, particularly at dusk and dawn. • If you see one deer, be prepared for more deer to cross the road. • Pay attention to deer crossing signs. • Always buckle up – every trip, every time. • Use your high beams to see farther, except when there is oncoming traffic. • Brake if you can, but avoid swerving. This can result in a more severe crash. • Remain focused on the road. Scan for hazards, including animals. • Avoid distractions. Devices or eating might cause you to miss seeing an animal. • Do not rely on products such as deer whistles. They are not proven effective. Based on State Farm’s guidance here, it’ll be interesting to see if features like night vision, large animal collision prevention and automatic high beams do start eating into repairers’ deer volume. Volvo is a particularly notable OEM in this space, having released deer autobraking as a standard feature on the S90 launched in 2016. In a 2011 news release announcing the then-upcoming tech, it said the system would use radar and an infrared camera — technologies that can work at night. It also noted that it had logged animal behavior to teach the AI what to look for.